They say you never forget your first, whether it’s a kiss, love, or even the first time you saw Star Wars. There’s something special about a first, and for me, my first foray into the world of assassins and templars came with Assassin’s Creed III. It was an experience that changed my life forever. As a lifelong gamer and a degreed historian, the blend of action, stealth, and history was the perfect marriage, and that birthed a love for a game series that carries me to this day. Now, Ubisoft has released Assassin’s Creed III Remastered for the PlayStation 4, Xbox One, and PC — with a Nintendo Switch version is coming in May — and the chance to go back and relive that wonder and excitement of my first time stepping into the shoes of an assassin makes this experience just as fun for me now as it was in 2012. Assassin’s Creed III Remastered doesn’t tear down and rebuild the game like what Capcom did with the recent remake of Resident Evil 2. The game is very much the same as it was seven years ago, with some new additions to help smooth out the gameplay and bring it more in line with the games that came after it. Character models have been upgraded, though the framework is still last-gen, and it’s very noticeable. Textures come and go, especially on faces and eyes, and there are visual bugs and glitches in the presentation, like NPCs walking backward on the cobbled streets of colonial Boston. But where the graphics falter in some places, they shine — literally — in others. The lighting effects have been completely revamped, and when the sun goes down in-game, the world seemingly comes alive with current gen lighting effects. 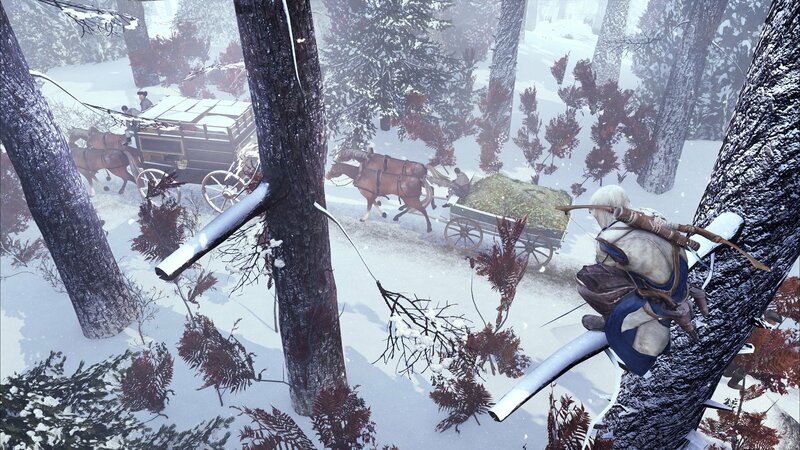 The snowy regions around Homestead are brought up to the level of detail of last year’s Assassin’s Creed Rogue Remastered, making the world that Haytham and Connor inhabit seem light years ahead of where they were on the PlayStation 3 and Xbox 360. The crisp shadows and foliage also show off the graphical upgrades, even though I encountered some odd clipping in snowy sections. Assassin’s Creed III Remastered runs at 30 fps, which is fine for a game like this, and Ubisoft didn’t try to push that any further, which could have led to even more issues, as we’ve seen in some of the recent past AC games. 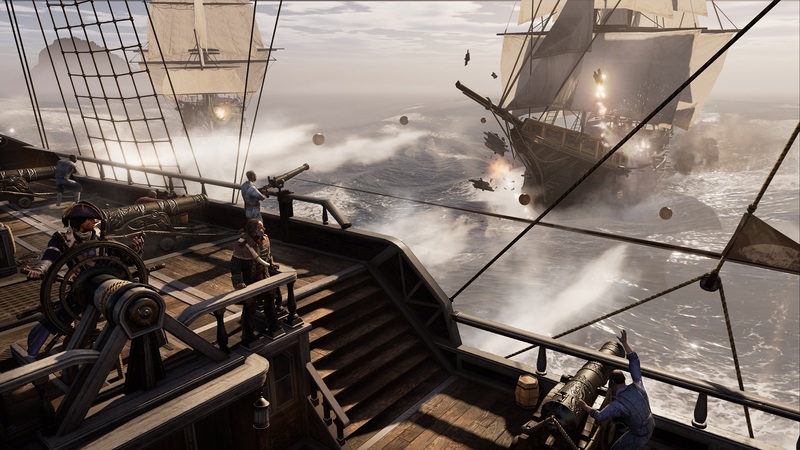 The water effects while sailing on the Prudence — and later the Aquila in the many naval missions — are better than what they were in the original release, but not on the same level as Assassin’s Creed 4: Black Flag. You can see where the developers plied their time in this remaster and where they left things alone, but none of these issues are a deal-breaker when it comes to replaying the game. Assassin’s Creed III Remastered includes some new play mechanics that were absent in the original release. The ability to whistle from bushes lends itself to stealthy playstyles, and better detection for dual assassinations means you won’t miss out on the chance to eliminate multiple enemies in one fell swoop. This addition alone helps fix some of the issues that players ran into in the original game. Connor also has the ability to craft new weapons and gear, whereas he had to purchase them in the previous version. Another major change is in free aiming range weapons. Assassin’s Creed III Remastered now feels more like Black Flag in that regard and offers varied options on how to take out enemies when stealth is of the highest importance. I’ve also noticed that the penalty for failing an objective doesn’t mean all is lost — and that goes for optional objectives as well. If you are playing a multi-part mission, and you have satisfied the objective requirements — like kill three guards from a corner spot — you don’t have to do it again if you hit a checkpoint and then fail the main mission. This makes achieving 100 percent in a mission easier, even if you slip up. Possibly the best part of replaying Assassin’s Creed III Remastered is getting to go back and replay Haytham Kenway’s memory sequences. As the series went on after ACIII, fans learned just how integral Haytham was to the mythos, and getting to play as him for six or seven hours — which was jarring and a little confusing on my first go ’round — is a complete joy here. I have much more respect for Haytham now, and in many ways, he is the star of this game, as opposed to Connor, his son. Haytham is one cog of a multigenerational chain that is explored in four different Assassin’s Creed games, and while I always questioned why he never got a full game to himself, his extended preamble in Assassin’s Creed III Remastered serves as that game I’ve always wanted. Assassin’s Creed III Remastered comes complete with the three chapter DLC expansion, The Tyranny of King Washington, which rewrites history in a fun and dark way. Again, as a history buff, this side story — which sees George Washington becoming a tyrant, requiring players to eliminate our nation’s first president as well as other key historical heroes — was a twisted ride. I’m glad it is included here. Assassin’s Creed III Remastered also comes with the Assassin’s Creed: Liberation Remastered. This is the same version of the game that was sold as a stand-alone product a few years ago with nothing particularly new added, other than the chance to pad your trophy or achievement numbers by going through the same game. Liberation began as a PS Vita exclusive, and as with most Assassin’s Creed games, I am deeply fond of this one for taking a few chances and introducing fans to the series’ first playable female protagonist, Aveline de Grandpre. 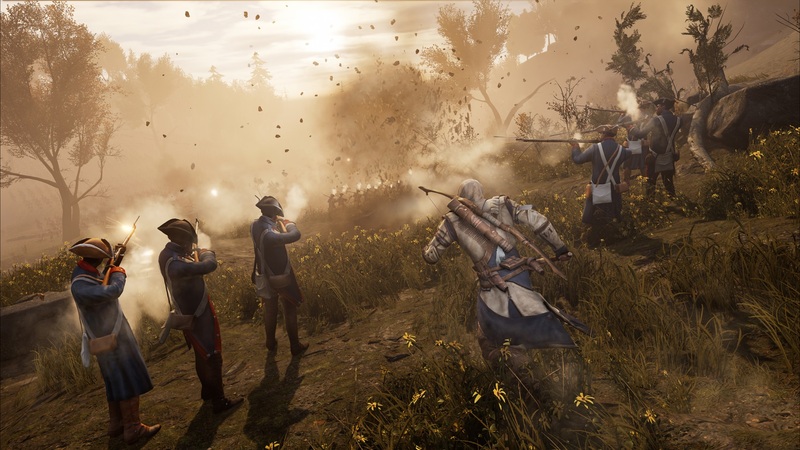 Unfortunately, the online multiplayer component is missing in Assassin’s Creed III Remastered. Along with my adventure as an assassin, ACIII was also my first time playing “assassin’s games,” for lack of a better term, with strangers around the world. I have some fond memories of those multiplayer games and co-ops, and I do miss the opportunity to play with others again. Assassin’s Creed III is sometimes remembered by longtime fans of the series as a problematic chapter, for a handful of reasons. The fact that Connor wasn’t as strong of a protagonist as Altair or Ezio, and the fact that colonial America didn’t have the grand architecture that the old world had, meant that Connor and his story was always going to be a bit of a disappointment. But for me — remember, this was my first Assassin’s Creed experience — it was a triumph. This marriage of my action, stealth, and history ignited a fire that drives my adoration for the series to this day. 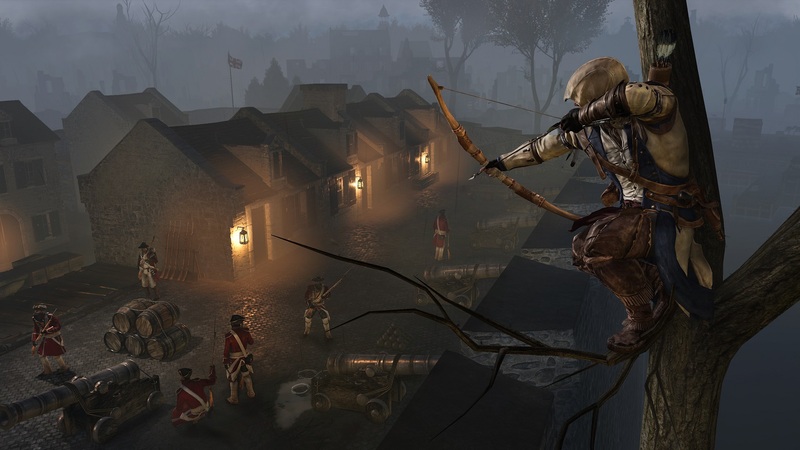 I will never forget playing as Connor, sitting on a rooftop, watching as British soldiers opened fire on a crowd, killing Crispus Attucks, and igniting a revolution that changed the world forever. I will never forget riding with Paul Revere to warn the irregulars of the British fleet, and I will never forget meeting both luminaries and common working men, both of which we now refer to as the founding fathers of America. This game has a deep place in my heart, and it is one I will always love for that reason, despite its many flaws. Assassin’s Creed III Remastered works to fix some of the mistakes of the first version, but it doesn’t try to reinvent itself. The story remains intact — even the “present day” chapters that made no sense to me seven years ago and barely make any sense now. I don’t hold it against the series, as Desmond Miles and his parkouring adventures are just a small part of the greater tapestry that this series weaves. Ubisoft has given fans a chance to play a game they may have missed, or heard was bad, and see for themselves if it is worthy of its place in the franchise’s timeline. The addition of Assassin’s Creed: Liberation Remastered and The Tyranny of King Washington rounds out a good package of early Assassin’s Creed games, one that is worth playing again, whether you have fond memories of the original or now want to see and play it on modern hardware. Assassin’s Creed III Remastered joins a hearty collection of remastered Assassin’s Creed games, including Rogue and the Ezio Collection, and gives longtime fans a chance to revisit these periods in history and discover why this series is loved by millions worldwide. And if it’s your first time, that’s okay too. Assassin’s Creed III was my first AC game, and you never forget your first. This review is based on the PlayStation 4 and Xbox One versions of the game. Review copies were provided to us by Ubisoft.